I've been struggling with what to call or how to classify this blog post. In truth these teas don't necessarily have a lot in common (price per cup ranges from 3.2p to a whopping 27.7p) but none of them are the standard big four - recently reviewed by me - and all of them are well-known and readily available in supermarkets and the like. Similarly none of them are loose-leaf choosing instead to offer their tea in convenient bags. These are the teas you might choose when you want the convenience of a teabag but think you'd like something with a bit more finesse than the average cuppa. It's been interesting hearing people's feedback on my previous review, whether on my Facebook page, in the comments section or in person, and realising how much marketing and branding plays into our choice of tea (and many other things I'm sure). Whether it's about the packaging, the name, or an association we have with a certain brand, it's pretty difficult to be objective. After all, how many of us go to the bother and expense of testing food and drink side-by-side to do a direct comparison? Every time I conduct a taste test I am surprised by the results. Of course objectivity when it comes to taste is a pointless concept - my cup of tea might not be yours - but it's amazing what a side-by-side comparison can reveal. I find it particularly interesting in the case of these teas, which all list different varieties of leaf in their composition, and all recommend different brewing times. I really had no strong pre-conceived ideas about any of them which made the test quite the adventure. So, in no particular order, here are my thoughts on premium everyday teabags. Yorkshire Gold - 4p per square bag. Recommended brewing time 4-5 minutes (I brewed for 4 and a half minutes precisely!). 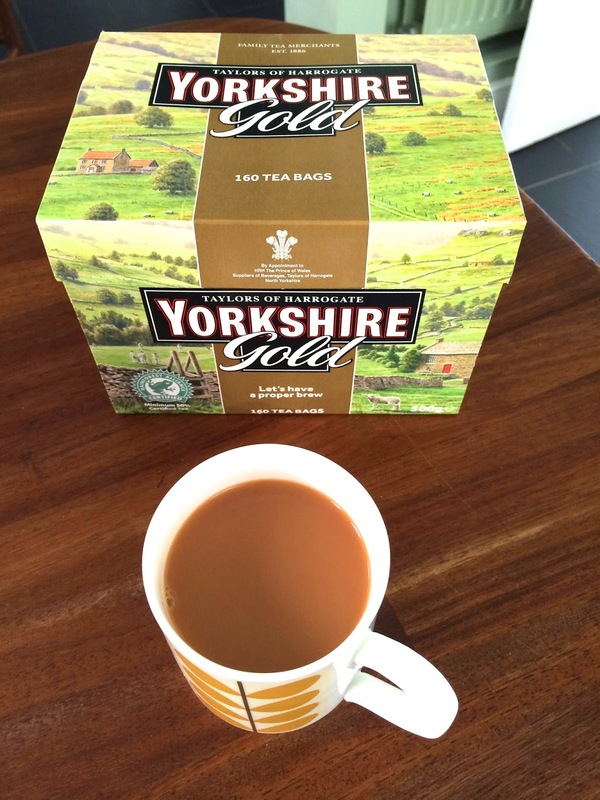 After my underwhelming response to Yorkshire Tea last time I didn't have particularly high hopes for the Gold variety. Unlike the other three teas on trial here I had fairly recently drunk a few cups of this after buying a box as a standby for visitors who don't want to fuss with leaves. On its own I'd thought it was pretty good; in a taste-test situation I thought it was, at best, okay. Nothing to write home about. It had the most orangey colour which led me to believe it would have the most striking flavour but actually I found it to lack any strong personality: not that malty, not that bright. Inoffensive but not exciting. 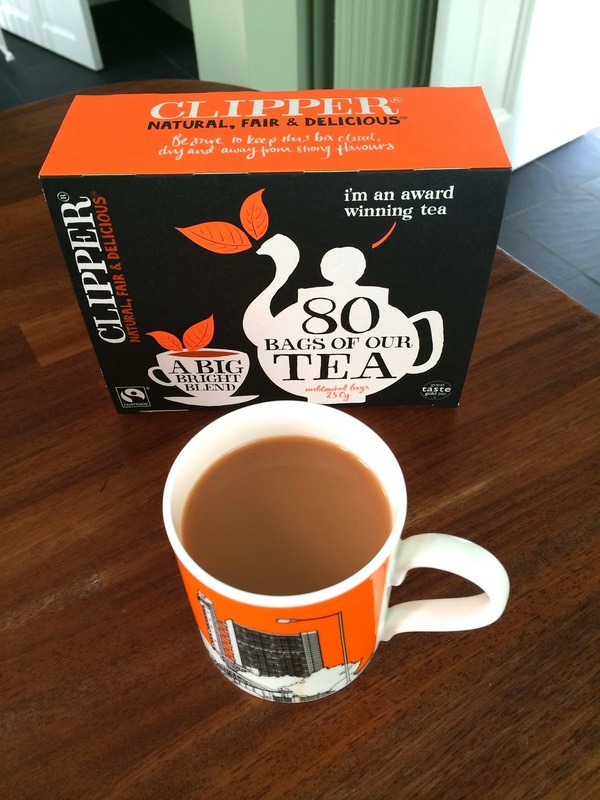 Clipper Fairtrade Everyday Tea - 3.2p per square bag. Recommended brewing time 2-4 minutes (I brewed for 3). This may have been the cheapest of the teas tested today but I found it to be a nice balanced cuppa: a fairly distinctive strong malty Assam base note but with a brightness that I found pleasing. It hit me on the side of the tongue and the flavour, especially for the price (less than half a pence per cup more than the big four), was quite complex. The old hippie in me also appreciated the compostable box, the unbleached teabags and the fair-trade policies of this tea. A really pleasant surprise. 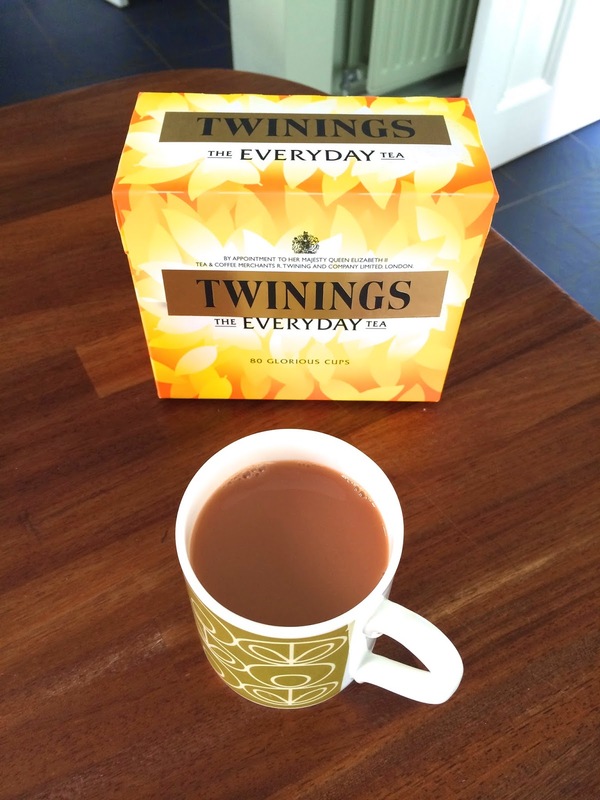 Twinings Everday Tea - 4.4p per square bag. Recommended brewing time 1-3 minutes (I brewed for 2). I really liked this tea. Although I've drunk a fair few Twinings in the past I have never (knowingly) tried their Everyday Tea and I have to say I was impressed. The Assam leaves provided a robust base to the cup but there was plenty of brightness to satisfy my needs (I didn't actually realise those were my needs until the last taste test...). I found this to be joint-top in its complexity: particularly surprising as it had the shortest brewing time of the four. It did particularly well to win me over as it had the darkest colour of the teas which made me think it was going to be too strong for my taste. It wasn't. In fact I really liked it. Teapigs Everyday Brew - 27.7p per pyramid bag (or Tea Temple as the company like to call them). Recommended brewing time at least 3 minutes (I brewed for 4). It seems unfair to compare this tea to the others as price-wise it's up there with a premium loose-leaf tea. But Teapigs have, rather brilliantly, carved out a niche all of their own: widely available but with the styling and quality of a premium product. Teapigs is the brand that cafes stock when they don't want to mess about with leaves but they still want customers to know that they are serious about the quality of their drinks. I am quite a fan of their herbal teas (particularly the peppermint and liquorice) but I had never tried this particular brew. Like the Twinings the tea was complex: some maltiness, a bright note and a robust earthy mouthfeel (I almost want to say a bit metallic but that's not quite right - earthy is more fitting). It was a good quality cuppa but not as much to my taste as some of the others. And at around seven times the cost I doubt I'd repurchase. It was really interesting comparing these four brews. Whereas before I felt that some of the cups just lacked any personality, that wasn't the case this time. 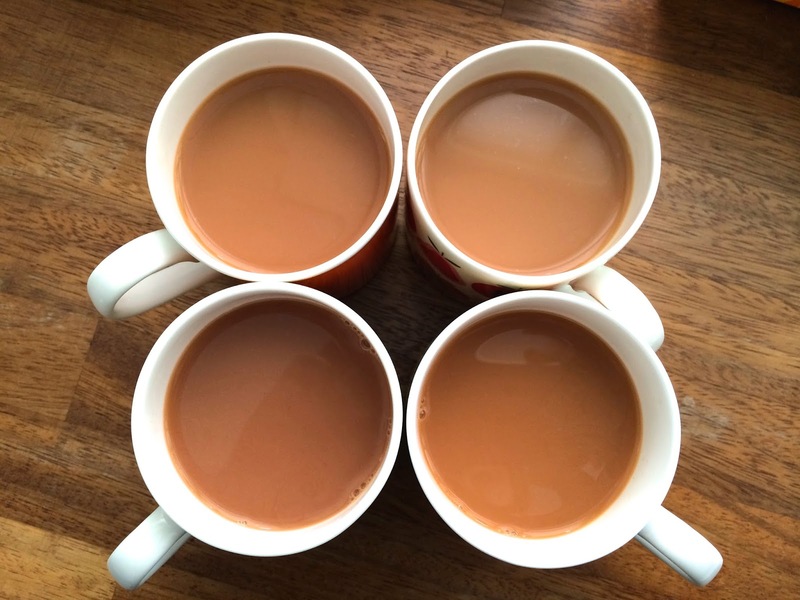 With the exception of the Yorkshire Gold which was a bit on the meh side, they all had a distinctive taste and (much more than last time) I really felt that which tea you liked best would depend on your particular preferences. I definitely like a bright cup of tea: not necessarily a straight Darjeeling which would lack a bit of strength and low-down grunt (okay I'm running out of descriptors here and grasping at car analogies), but something that's refreshing. So my favourite was definitely the Twinings. Coffee Boy tends to like a malty Assam and when I dragged him in to offer a second opinion he liked the Clipper best. I must admit I was really impressed with the quality of the Clipper too (the fact it was the cheapest was a bonus) but it didn't have enough of the bright, refreshing quality I find I need. If you're the kind of person who likes a really rich cuppa with an earthiness and discernible tannins, then the Teapigs would be for you. I thought the complexity and quality of the tea stood out but it just wasn't as much to my taste. Coffee Boy really didn't like it describing it as "a bit vegetal". Also, when discussing everyday tea, price has to be a factor. In that regard the Clipper and Twinings Everyday offered fantastic value-for-money: hardly more than the big four but offering way more in terms of taste. To double check that was really the case I brewed a cup of Tetley (my previous everyday favourite) to try alongside these four. The Tetley was still good (and more to my taste than some) but it couldn't compete with the Twinings, Teapigs and Clipper for complexity. Wow, this is brilliant. Thanks Natalie. I just buy PG Tips without thinking (drink approximately 4 cups of tea per month so don't really think about it.) I'll definitely pick up one of the premium brands you recommend instead. Top nerd points to you, also. I love a bit of nerding out Caroline; thanks for appreciating. If you saw my previous review you'll know that PG is the only tea of the eight I've compared that I'd actively seek to avoid! 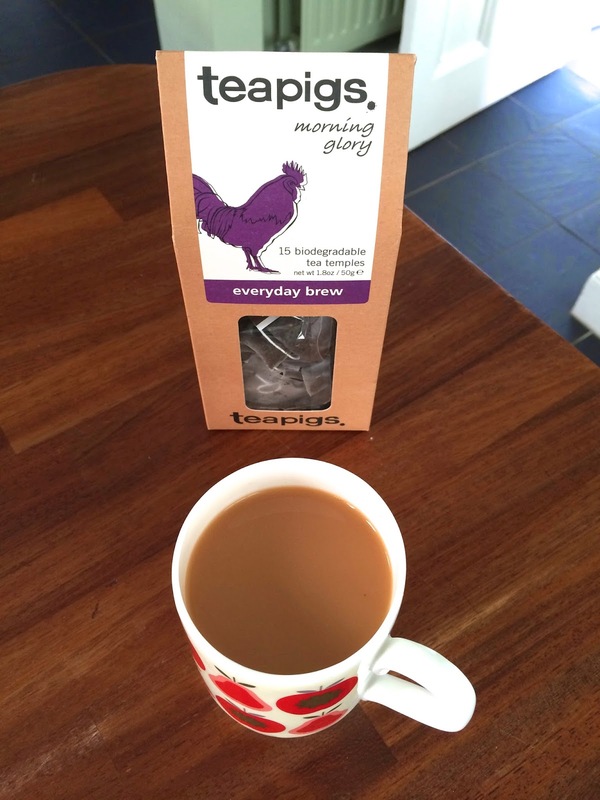 But if you like its robust maltiness, the Teapigs might be most to your taste. Of course its significantly more expensive but at four cups a month you could probably stretch to it! Thank you so much Love, Love, Love. It really means a lot to know that my efforts are appreciated. And don't forget to let me know if you have any taste tests that you'd like me to do. As Caroline spotted above, I do enjoy nerding out! I love reading your reviews! I only use teabags when I travel (I always have a supply in my purse in case I can't get a decent cup of tea somewhere). My everyday tea is Twinings Earl Grey loose leaf, which I can get for about $10 for a 7-ounce/200 gram tin, which comes to about 15 cents (or 10p) per cup. Thank you Jean (and sorry for the extended absence). Teabags definitely have a place - I used to take them to work with me when I didn't want to mess around with leaves and brewers. I'm happy to have found a teabag tea that I really enjoy. I also like Earl Grey now and then: it really hits the spot when you want something refreshing doesn't it? I think tea appreciation is really subjective, I personally won't drink anything other than Yorkshire Gold and I really dislike both Twinnings and Tea Pigs, neither are rich enough for me. I suspect maybe the preparation has a lot to do with it, it's best prepared in a mug, but it's very strong so I'd never dream of brewing it for 2-4 minutes, you'd end up with a cup of tar. Yes, I think everything to do with eating and drinking is so subjective. I guess the length of the tea aisle in most supermarkets is testament to the fact that tea-drinking is no different! In terms of preparation, I really felt that the only way to be fair to each of the teas was to brew them in the way that each company recommend (and Yorkshire Tea have even written a post about it on their website!) otherwise the subjective exercise becomes even more subjective. I've also noticed when Coffee Boy and I are nerding out over coffee tasting, we seem to taste completely different things, so there can never be any right or wrong answers. The best thing is finding a tea that you like, that brings a little bit of joy to your day. You've obviously done that, which is what it's all about, as far as I'm concerned. I'm in the US and have been drinking tea for over 40 years. I started with Lipton and realized how insipid it was after drinking a tea called "Tetley British Blend" sold here. On a visit to the UK about 10 years ago, I discovered that the UK Tetley had about 3 grams of tea vs about 2.5 grams in the British Blend, but the UK tea had a different flavor. I'm on a mission to find a tea that has a Darjeeling aroma but is also strong, kind of malty. I'm not sure if the description "bright" refers to tea that has a distinct aroma. Nowadays, virtually any British tea is available on Amazon or Ebay. What tea would you recommend for everyday drinking where you can sense that very distinct Darjeeling aroma even before you start drinking it?